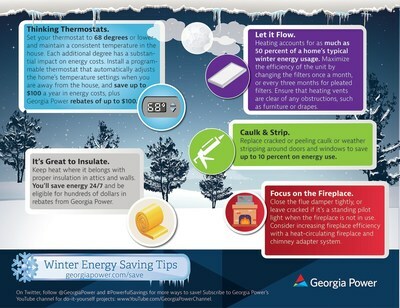 ATLANTA, Jan. 18, 2019 /PRNewswire/ -- As winter temperatures begin to drop, Georgia Power encourages customers to keep safety in mind and offers safety tips to help prevent electrical fires. Keep space heaters away from furniture, curtains, sinks, tubs and water. Do not lay rugs or carpet over the cord. Do not use heaters if the cord is frayed or broken, and do not use an extension cord. Turn off heaters before leaving home or going to bed. Check for outlets that have loose-fitting plugs, exposed wires or broken plates. Have them fixed by a qualified electrician. Prevent overloading equipment and circuits. It can cause insulation to burn, create sparks and leave exposed wires. Prevent oil and dirt buildup on electrical appliances which can cause electrical equipment to overheat and short-circuit. Know where the nearest fire extinguishers are and how to use them. Only Class C extinguishers are safe to use on energized electrical equipment. For additional video tips on preparing for winter weather, visit GeorgiaPower.com/WinterPrep. Colder weather can also mean higher energy bills and, as the low temperatures continue this winter, Georgia Power offers customers a variety of free tools and resources to help them stay warm while saving money and energy. The company reminds customers that making small changes today can deliver big savings throughout the winter and year-round. Let the Sun Shine In – Keeping the blinds and shades open during the day is a no-cost way to naturally heat your home. Close them at night to reduce the chill you may feel from cold windows. Let it Flow – Heating and cooling accounts for as much as 50 percent of a home's typical winter energy usage. Maximize the efficiency of your units by changing the filters once a month, or every three months for pleated filters. Focus on the Fireplace – Close the flue damper tightly or leave cracked if it's a standing pilot light when the fireplace is not in use. Consider increasing fireplace efficiency with a heat-circulating fireplace and chimney adapter system. Thinking Thermostats – Install a smart programmable thermostat that automatically adjusts the home's temperature settings when you are away from the house and save up to $100 a year in energy costs. Caulk & Strip – Replace cracked or peeling caulk or weather stripping around doors and windows to save up to 10 percent on energy use. It's Great to Insulate – Keep heat where it belongs with proper insulation in attics and walls. You'll save energy 24/7 and be eligible for hundreds of dollars in rebates from Georgia Power. Even with energy efficiency and careful planning, cold temperatures can mean higher bills. If customers need assistance paying their bill, Georgia Power is here to help. The company works with customers to coordinate payment arrangements and discounts such as the Senior Citizens Discount and can connect them with community organizations which may be able to help them pay their bill including The Salvation Army's Project SHARE program. Additional information about bill payment assistance is available at www.GeorgiaPower.com/assistance or via phone at 888-660-5890.